Graze box is still close to the top of my favorite boxes! Like I mentioned a couple of weeks ago, you can get the box weekly, biweekly, or more often if you prefer, and it's always $6/box. Using my referral link, you can get your first and fifth boxes free. You can also cancel at anytime, and review items to decide if you want to get them again or never. You can also review items you haven't already gotten if you know you aren't going to like it and change the option to 'trash' and they (probably) won't send it. That makes me seriously happy because I hate to see food wasted and don't want to get things that I know no one in my family will eat. In this box, I received the Smoky Chipotle Dip with Rosemary Breadsticks (like), Chili & Honey Almonds (trash), Triple Berry Smoothie (try), and Fruit & Seed Flapjack (love). The win of this box was the Flapjacks, I seriously love these things now! The fail of it was the almonds. I like almonds, but the flavor combinations just didn't taste right and these were sadly thrown out. What did everyone else get? I know we all get boxes on different days but it's still nice to see what snacks others are getting. 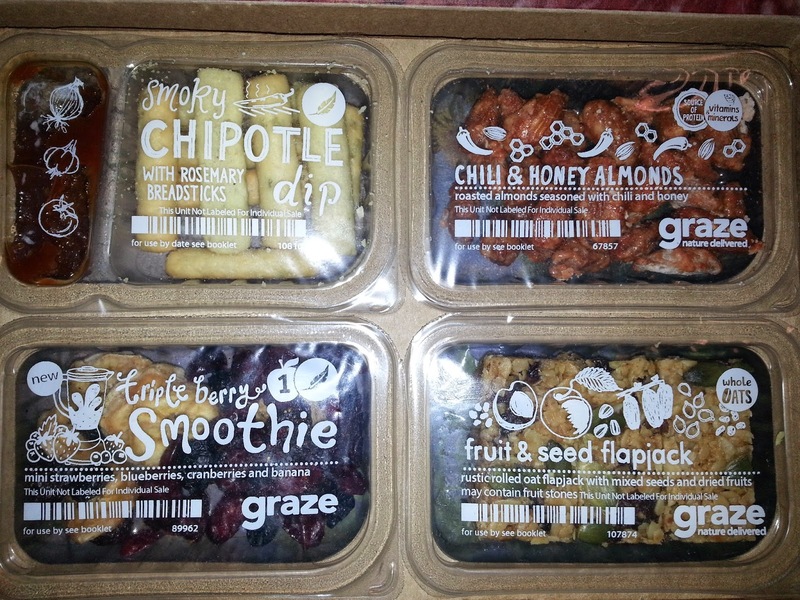 I love my Graze boxes! The flapjacks are always good, but my favorite item is the toffee caramel apples!